As the owner of a small wedding planning startup, a friend of mine didn’t have a lot of time or money to put into a website – but she knew she needed one, or her business would be near invisible. Despite her lack of programming skills, she went full speed ahead into single handedly creating her online presence. Starting a website from scratch was actually not the daunting task she feared. With the right tools, she got a WordPress site up and running within a couple of weeks. After the initial buildout of the site, she continued to expand and update it herself as her business grew. Anyone can purchase a domain name, host a site, and create content using bare-bones HTML, WordPress, or a site builder like Wix. We’ll cover each method below. The first step to creating a website, no matter which approach you decide to use, is selecting a web hosting service and a domain name. The web host is the company that provides the server and storage space for your site and gives the online world access to your brand. The domain name is the URL (e.g., www.hostingadvice.com) that people use to navigate directly to your site. This is the super easy part. The web’s top-rated hosts have pulled out all the stops to expedite and alleviate the initial website creation process — often beginning with a complimentary domain name registration, single-click installations for popular CMS and blogging platforms, a free website builder, and marketing credits. Registering a quality domain name is essential to helping people find and remember your site. Many web hosting services offer complimentary domain name registration for the first year of service, which means they will work to keep you as a customer. Make it short and memorable: Shorter domain names are easier to remember. The title should be something that sticks in people’s minds. Long domain names only work if they’re unique and catchy. Use relevant keywords: Your domain name is another opportunity to incorporate keywords that contribute to your overall SEO strategy. Keywords that are relevant to your business niche will make your domain name further stick out in people’s memory and boost your search engine rankings. Research domain names: Check to see if other companies or individuals are using a domain name that is too closely related, to avoid any conflicts or confusion. Choose the appropriate domain name extension: As you know from browsing the web, domain names can end in .com, .org, .biz, and other extensions. Pick the one that best fits the purpose of your website. For more advice on choosing a domain name from experts in the field, click here. There are three main ways to build a website. First, you can start from scratch and use HTML to build the site from the ground up. You could also use a blogging platform like WordPress or a content management system (CMS) such as Drupal or Joomla. The third option — our favorite for first-timers — is to use a WYSIWYG site builder provided by your web host. Each approach has its merits and challenges, and we’re here to help you determine which is best for your next project. Using a website builder – an application that takes you through the steps of making a website without code – can be both liberating and empowering. All of the coding is done by the provider on the backend, and in essence, it’s not much more challenging than using a word processor. Website builders, like Wix, allow non-programmers to design web pages visually, without coding know-how. Typically, a site builder or template-based site-building method offers fewer customization options than if you build the website from scratch using straight-up HTML, but for the limited skills required, site builders provide flexibility and a good user experience for newbies. The most popular WYSIWYG (What You See is What You Get) website builders include Weebly and Wix. Many business owners and employees have little to no coding skills. At the same time, it can be limiting for some to have to rely on a Web designer/developer to create a website and make updates. WordPress is a catch-all solution for businesses that want a basic website with minimal investment of time and money. Almost one-third of all websites on the internet exist on the WordPress platform, and even big companies, like CNN and eBay, use it. There are free and paid versions of the software, and there’s plenty of user support available online. I love the WordPress dashboard for its sleek, clean design. Once you befriend it, you’ll never go back. With many themes and layouts to choose from and options to advance to more complex designs and features, WordPress is a versatile choice for all kinds of businesses. In fact, it’s the platform that powers HostingAdvice.com, as well as all of our sister sites CardRates.com and DatingAdvice.com. Web design skills are highly valuable in the job market and maybe you’ve thought it’s something you want to pick up. Building a website from scratch will give you the tools to create and customize a site exactly as you see fit. There’s a higher learning curve but a greater reward, as knowing HTML will allow you to fine-tune your site design and carry those skills forward to expand and update the site with ease. If you’re a programming novice and determined to learn, you can pick up the coding skills you’ll need from a myriad of web design books (the O’Reilly series is a good starting place) and websites like the World Wide Web Consortium (W3C) Schools. Building a website with a free website builder is a quick, easy, and straightforward process. Wix is one of the most popular choices, as it has good support, reliable service, and a user-friendly interface. This brief tutorial will guide you through everything you need to know to get started. Enter your email address and password at the Wix.com signup page. Note that the email address handle will become part of your free domain (if you don’t have a custom domain), so keep that in mind when signing up. If you’re still unsure, I welcome you to check out our expert review of the Wix platform below. Select the category that best describes your website. This helps people find your website and helps Wix cater to the platform’s diverse user base. Your selection will determine what kinds of templates you browse, so consider the best option for the style of site you want to build. Wix now has two options for creating a website. In addition to the traditional Wix Editor, there’s also Wix ADI, an artificial intelligence program that designs custom sites based on questions you answer. We recommend using the Wix Editor, which gives you full control over the customizations available on the platform. However, if you want to try the Wix ADI, by all means, go for it! Choose from a wide variety of templates, all different depending on the type of website you are creating. Filter options by image, search by keyword, or sort through the templates by category. The wealth of industry- and niche-specific themes available in Wix is something I find particularly attractive. You can also opt for a blank template to start completely from scratch or with a basic layout. Each template starts with pre-filled text and a background image. Your template is a starting point to make the site your own. One of the first things you should do on your new Wix page is add your business information. Fill in your brand name, slogan, and other pertinent details by simply clicking on the text that needs to be replaced. You can also change the visual aspects of the page, including the background image, and add or swap out images on other pages on your site. There are lots of ways to add content and customize your site. Click the Add button on the left-hand menu for a swath of options — text, buttons, slideshows, menus, et cetera. Under the Apps button, there are many features you can add to your site for additional functionality such as comments, live chat, and an online storefront. You can also upload your own multimedia content, such as fonts, images, videos, and music, and start a blog. Simply click “Publish” in the right-hand corner to put your site up on the web! You’ll choose a domain, which can be a free domain from Wix.com or a customized domain you acquire via a domain registrar. Using WordPress to create your site is a similar experience to using a website builder in terms of process. Which platform you should use is a matter of preference. It depends on which one feels most intuitive to you and gives you the most flexibility for your site design and maintenance. A big advantage of going with WordPress is the large community of support, both official and from other WP software users. Most hosting plans include easy access to WordPress — installing the software with one click, or better yet, having it preinstalled for you. In most cases, you can simply log into your hosting control panel and find the option to install the WP platform. If your hosting service doesn’t have this capability, you can find the manual installation instructions here. Take some time to get acquainted with the WordPress backend for your account. You’ll find where to manage your posts, pages, and comments; change the site appearance; add site editors; and install plugins. Your dashboard has everything you’ll need to keep track of the content on your site and customize its look and feel. Under the Appearance tab in the dashboard, you can select from a number of free themes (or opt to pay for one). Installing a theme is as simple as selecting “Install” and then “Activate” for the template you want. You can change your theme at any time without altering the other content on your site. By default, WordPress will place your latest posts on your homepage. To select a specific page to serve as your homepage, choose “Settings” from the dashboard menu and then choose “Reading.” In the Front Page Displays section, opt for “A static page” and then select the page you’ve created as your homepage. Plugins are extensions — not set up in WordPress by default — that add new features to your site. WordPress plugins can enhance your site’s functionality, help you achieve the goals you have for your site, and give your website visitors a better user experience. Plugins abound for WordPress users! Just download and install to extend the platform’s already-robust functionality. For example, the Google Analytics plugin helps you track your site activity, and the NextGEN Gallery plugin lets you display image galleries. Under “Plugin” in the dashboard, you can search through the options — literally thousands of free plugins. Just click “install” and you’re good to go. At this point, you’ll have created a content-filled, visually appealing and functional site. Publishing in WordPress happens on a page or post level, so you’ll need to click “Publish” for each area of your site. You can wait until your website is completely ready to launch to publish your content or publish as you create individual pages and posts. For those who want a challenge and have a little extra time, making a website via HTML is a worthwhile endeavor that develops your understanding of web editing and design. You can set up a basic site in just a few hours, and build upon it as you learn more HTML and CSS skills. As was the case with the first two website-building routes, your first step is to sign up with a hosting provider. 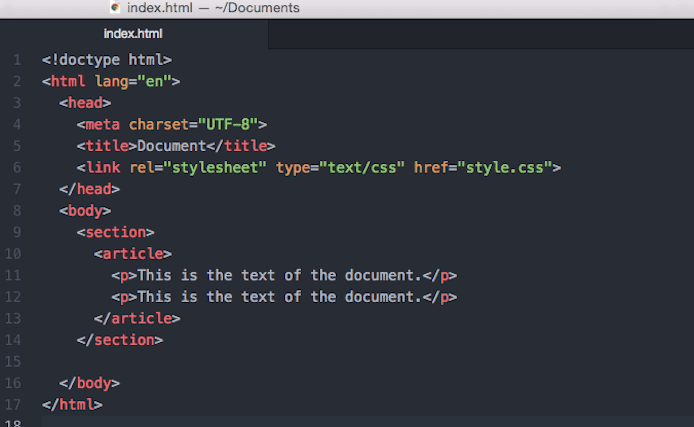 To write HTML tags, you’ll need a high quality text editor that caters to the language of the web. Notepad++ is a good option for Microsoft users, while TextMate is ideal for Mac users. Cross-platform text editors include Atom and Sublime Text. At its simplest, this is what your site’s main index page should look like when you’re drafting it up in your text editor. <html> tags enclose the entirety of your site content and indicate that this is an HTML document. The <head> tag encompasses your page title, meta tags (tell the browser details about your page content and display), and references to your external CSS files for styling your page. The actual content of your page goes between the <body> tags. When building your site, you’ll want to organize your files into folders according to the structure you want your site to appear in. For example, you might create a folder for your About page that has your main about.html file as well as any related CSS that adds style to your site and other HTML files that support that content. When adding links throughout your site to your site’s pages, you will reference their folder location in the directory where you store your files. <header> indicates the top of your document and is where your page title and logo appear. <nav> is used to build your site menu, the main navigation of your site where visitors find top-level site links. <section> denotes the main content of your page. It’s used to group like content within a page. Think of articles you find online that are grouped under individual headings. <article> is used for individual pieces of content on a page such as a blog post, image, video, or other multimedia. It’s a way to structure the page so these items can be easily distinguished. 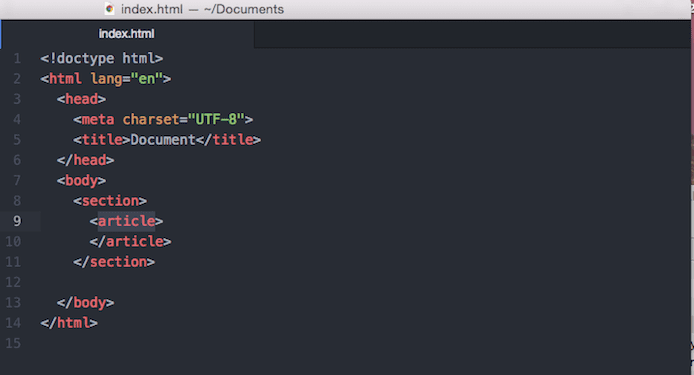 Complete with HTML tags, your website’s basic page structure should look something like this in your text editor. You’ll also want to add a basic navigation bar for your site. This provides easy access to the main pages of your site. You’ll use the <nav> tag and the <ul> or unordered list tag to set this up. In HTML, your site’s main navigation is actually just an unordered (think bullets) list of URLs. And voila! Now your site visitors can easily navigate to your blog, product pages, drop you a line on your contact page, browse customer testimonials, and back to the homepage again! You can make your site more visually interesting with formatting, colors, and images only using HTML. However, incorporating CSS, or cascading style sheets, into your site gives you a lot more control over its appearance, and sites that use CSS look more professional overall. CSS is designated in separate CSS files. The main file is typically titled style.css. Some basic functions of CSS include adding colors, borders, and backgrounds, and applying the box model to organize the content on your pages. This step is more advanced than using basic HTML, but can greatly enhance the aesthetics of your site. Once you’re happy with the overall layout, you can publish your site. It’s perfectly fine if your site is very basic to start out with. As long as it looks professional, you can feel good about putting it out on the web, and improve it as you develop more HTML and CSS skills. Deciding What to Make a Website About Is the Hardest Part! As was the case for our event-planning friend, you may not think that you can build your own website at first — but the truth is it’s now easier than ever for the complete beginner to create a functional and visually appealing site that people want to visit. With the help of online resources and support from the WordPress community, my friend built a site she was proud of – and you can, too. The most important thing to consider about your site is the content, as this will be what draws people to visit and keep reading. Consider what you want your site to be about, whether it’s your business or a blog on a specific topic. Consider carefully because this will determine your web design direction, too. Once you’ve got some content ideas and a concrete plan, you’re ready to start your site building adventure by signing up with a host.